St. Scholastica nursing student Mariah Sandstrom ’16, right, talks with the "patient." Michelle's face is a mask of pain as she hunches over in the examination room. One by one, a team of medical specialists gently ask her questions, seeking information that might reveal answers and solutions. Michelle describes her chronic lower back problems, complex medical history, and living situation. Afterward, the medical team members gather to discuss the case. The occupational therapist wants Michelle to make some changes that will allow her to sleep better, something she's been struggling with. The social worker is concerned about Michelle's comments that she doesn't want to live through 30 or 40 more years like this. The nurses want to take a holistic approach to treatment, since the back pain affects all aspects of Michelle's life. A physician and pharmacist weigh in with their treatment recommendations. However, Michelle will never hear their advice. She's an actress, playing a role as part of an interdisciplinary learning experience for local students in various healthcare fields. The College and the University of Minnesota-Duluth have collaborated on Observed Simulated Clinical Interdisciplinary Experience (OSCIE) labs since 2002. 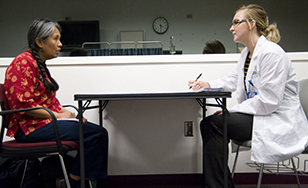 Students take turns interviewing "patients" while their peers watch from an observation room. "The cases are very complex," said SueAnne Mattson, assistant nursing professor, who helps coordinate the labs. "Students really have to ask the right questions." UMD trains and hires the actors and coordinates the scheduling, while St. Scholastica hosts the interviews in its simulation lab. UMD medical school and pharmacy students and St. Scholastica nursing, OT, physical therapy, and social work students take part in the weekly labs. Nursing student Aaron Egelkraut '16 sees the value. "This exercise helped with the communication part of health care," he said. "Now that we have a better understanding of what some of the other professions do, we as nurses can communicate the right needs to the right professionals." Social work student Caitlyn Taylor '16 said it was refreshing to see all the students take a holistic approach to care. "It's nice to know that other professionals are aware of social issues that could be impacting this particular client's situation," she said. Mattson said the labs can help to prevent the job-title based hierarchies that often appear in the medical field. "The earlier you can have interprofessional activities, the more likely you are to influence them to be positive experiences," she said. Increased communication enhances patient safety, she added. Such efforts for interdisciplinary connection are becoming commonplace now, she said, but "we were doing this before it was cool.